First, let’s start with the basics. Pick up my favorite fall bootie (also available in black), a fab-fitting pair of leather pants, a pleated leather skirt, the perfect pair of black skinny jeans, the coziest cashmere sweater and more. SO many good things. If you’re searching for some holiday party looks, my money’s on this gorgeous emerald midi skirt or this simple red Shoshanna number. If New Year’s Eve is already on your mind, you must check out this sequined McQ dress. Stunner! In an outerwear rut? This Jenni Kayne double breasted tweed coat is the quintessential “borrowed from the boys” basic. For a luxe look that’s soft and versatile, I’m loving this Norma Kamali shawl-collar coat. My favorite coat? This camel L’Agence piece. Timeless elegance at its best. As far as accessories go… I’m craving these lace cutout booties, this Rag & Bone hat (and this one), these Rachel Zoe oxfords, these Thierry Lasry sunglasses and these black Oscar de la Renta tassels (would also love these pink ones)! Get your favorite pieces before they sell out by shopping the sale right now (starts at 7am CST)! Enter code FAMILY25 at checkout to save big on your purchase (see website for designer exclusions)! Love the color palette for this Edit and I’m so excited for the shopbop sale. This roundup is a breath of fresh air! I’ve been in the black, dark grey, and olive doldrums. This is definitely my inspiration palette for holiday dressing. Great Edit, especially the shoes and jewels. PS, I also have on my Craving tomorrow the Vince booties, leather pants and a knit. Crazy! Crazy good! such a gorgeous color palette! it feels very fresh and seasonal and can easily imagine wearing these pieces to a holiday ballet. I LOVE the color palette you used for this post!! That fur collar is kind of amazing…and the Zara coat is gorgeous!! Great picks! The pleated leather skirt is amazing! I haven’t seen any like it. Hopefully it will find it’s way in my cart during the sale. Wow, this color palette is so gorgeous! That wool check scarf is calling my name!! Looks so cozy and I love the color! And that Givenchy clutch is simply divine. To.Die.For. I can’t wait to shop the sale! I love that bejeweled hat and statement necklace! I bought a similar hat at Nordstrom Rack and I can’t wait to wear it! AH, you have the best taste! I might have just clicked and drooled on everything. Those grey booties! The periwinkle dress is gorgeous! 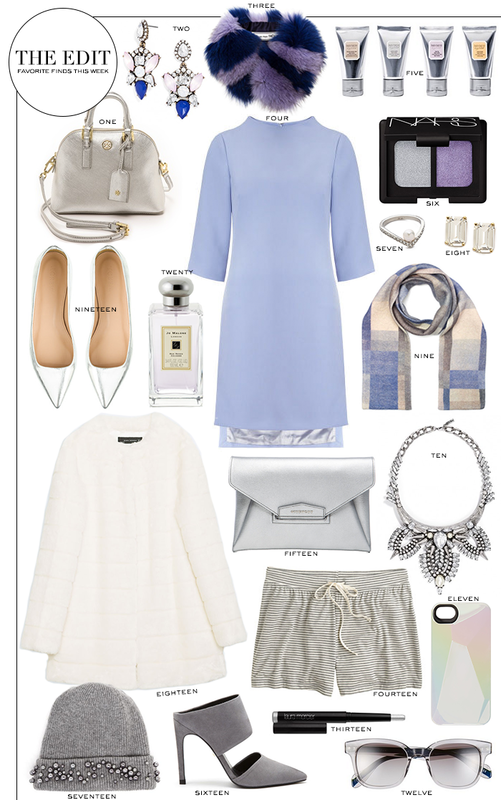 The Darcy Dress from Whistles is absolutely amazing- I cannot get over how amazing the lilac color is! Between that coat and that dress, you have me DREAMING! I want all of this, of course. I am in love with that little fur stole! and your givenchy clutch really is calling my name! Love number 2, 10 and 14! Perfect! Wow I love how fun these are. Especially that jeweled tom! Amazing picks!! The colors are all amazing!! Love the grays and blues!